Daddy mummy are proud of me!!! You might or might not heard of Babywise before. I will give a brief introduction of Babywise. It is the infant management plan that helps infants synchronize their feeding, wake-time and night time sleep cycles by using parent directed feedings (PDF) method. There are a lot of praises as well as criticism on this theory. Since I am using this theory on Esrene, I thought of sharing my experience and thoughts here. 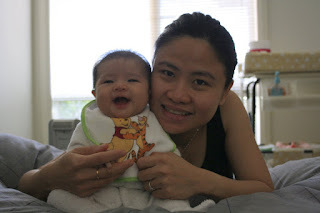 When Esrene was just few days old, I was told by the lactation consultants to use demand feeding on her, which is the method most of the people practicing. Oh boy, it was a nightmare for me and Selwyn! I will have to feed her as and when she cried (which we assume she is hungry after checking to make sure she has clear nappies). I had to feed her in 30 min, 45 min, 1 hour or 2 hours time. Her sleeping and feeding was everywhere and I was miserable having to feed her on demand, especially at night! We tried for 2 days and decided it was too much for us. So I picked up the Babywise book that I read during my pregnancy and decided to give it a try. I tried the Babywise approach for 2 days and I started to see "the light"!!! She was feeding well and starts to have a schedule. By the end of 7 weeks, Esrene started to sleep through the night (9 hours), just like what the book says! After feed, I will try to keep her awake for a while (for newborn normally just 5 to 10 min) before putting her down to sleep. I will try to let her has at least 1 to 1.5 hours of nap each cycle. Newborn are sleep head. They can sleep for very long hour without feed. I wake Esrene up after 3 hours if she did not wake up herself to ask for the feed. However, night time I will let her sleep until she wakes up herself (but not over 5 hours to maintain my milk supply). For newborn, make sure she has 7 feeds per day. Esrene is having 6 feeds now after she starts to sleep through the night for 9 hours. When they grow bigger, you can extend their feed longer to say 3.5 hours to 4 hours. If they wake up crying for milk shorter than your predicted hour, feed them. After putting Esrene on the cot to sleep, we will let Esrene cries for a short period of time, maximum 30 mins, before offering comfort. No rocking, no carrying her on the arm to sleep and put her down when she is still awake. The purpose behind is to let the child learn to soothe themselves to sleep. It is never easy to hear your baby crying. At the beginning I can't bear it, but have to close the door and went out to the living room to avoid hearing the cry. I even tempted to let her fall asleep on my breast then only put her down to her cot, but this is not the way to teach her to sleep herself. It requires perseverance, patience and consistency. This is the toughest part in the whole approach I reckon. Now Esrene will only cry for 2-3 mins before she goes to sleep herself, sometimes she will not even cry. We were told not to pick up the baby straight from the cot/bassinet when she cries because a lot of baby will have sleep crying, which is very common in their sleeping cycle. During her 3 hour cycle, Esrene will sleep for around 45 min then she will start her sleep crying. Before that I will go in and pick her up thought she is awake. So now when she cry half way through her sleep, I will let her cry for 5-10 mins before I pick her up. 95% of the time she will go back to sleep within 3 min and sleeps for one more hour!! Looking back, I have ruin her sleep last time by picking her up so early! 1. Good theory to helps parents set a good feeding and sleeping schedule for the baby. End result ---> happy little bub! 2. Parent directed feeding will not affect baby's weight gain. Esrene has been gaining every good weight. Moreover, if she is hungry before 3 hours, I will still feed her. This is the principle of PDF. 3. A little cry will not hurt the child or make her feel "unloved". Esrene wakes up smiling at us most of the time. 4. When the schedule is established, we parents can plan our day more efficiently. Happy parents, happy baby. I am not trying to promote Babywise. I am just sharing it as it works for me and Esrene. If you are interested to try out this theory, you can read more from the book On Becoming Babywise. I hope these sharing help! During my wake time, mmmy has been giving me tummy time as many time as she can to help the development of my sensory and movement control. 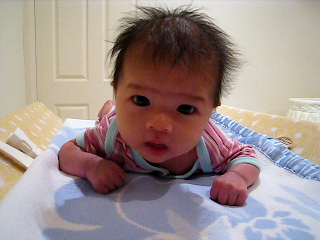 Since week 7, I started to lift up my head when mummy put me on my tummy. Somwtimes, I will be lazy as well, just rest my head on the side. Now I am 10 weeks old, I want to show you how good I can lift up my head. I can go this high!!! I am two months old already. As I am soon to out grow my bassinet and has been sleeping longer hour at night, now mummy starts to train me to sleep in my own room during day time. Mummy has to do a lot of setting to make sure my room is comfortable and safe. She on the heater to warm the room and put me on my sleeping beg. Lastly she has to switch on the sound monitor so that she can hear me anywhere especially when she is cooking in the kitchen. When mummy starts to put me in my cot to sleep, I thought it was a playground. I will observe the nice decoration around, played with myself for 10-15 min before I started to feel bored and realised that mummy put me there to sleep! I will cry and cry to protest. But at last I still fall asleep but will wake up shortly within 45 min to 1 hour coz I am still not used to the new environment. However, day after day, I get used to my room and I start to sleep peacefully there. By the way, I found a new toy!! My hands!!! I start sucking on my hands every now and then, and I enjoy it so much! Mummy said it is like a yummy drumstick to me. Did mummy tell u that I don't really like dummies? I will spit it out most of the time. I visited a few parents rooms in the shopping malls when mommy had to change my nappy or feed me. Among all the parents rooms we have visited, mommy loves The Pines' parents room the most. Why? Nice breastfeeding room with TV! Mummy get to watch tv while feeding me (& daddy too if he follow us there). Free warm baby wipes! Daddy said if we stay within the walking distance from that shopping mall, mummy can bring me there to change nappy every time. Save a lot of baby wipes money! They also have a very nice bottle warmer, but since mummy breastfeed me, so we don't need to use it. My satisfying look after milk milk. Mummy has been training me hard to sleep by myself. At the beginning, I will cry for half an hour or sometimes even more when mummy put me down to sleep. As times pass by, when it is my sleeping time, mummy put me down in my bassinet, I will cry lesser and shorter because I start to know that it is time for me to sleep. This is how I sleep now, 1-2 min of crying or screaming, 2-3 min of talking to myself or "meditating", then I will go into my lulla land. Today I did two things that made daddy mummy so proud of me. I slept through the whole night, 7 hours since the last feed and woke up a happy girl smiling at daddy mummy before mummy feed me. Even though I should sleep for 9 hours instead, but then daddy & mummy said it is a very good progress. I will be able to sleep through 9 hours soon. Then in the evening after daddy gave me the bath and put me on my tummy on the changing table to massage me, I lift up my head so high up looking at them and smile. They were so thrilled to see me able to lift up my head high up and said to me"Well done Esrene, we are so proud of you!" I am as cute as daddy?? Today mommy received a big parcel from US, it is from Auntie Shirley. In the box there are a lot of gifts for me!! Auntie Shirley bought me a lot of nice dresses and onesies so that mummy can dress me up. She also bought me some cute hair pins to put on my hair. Besides that, she also got me a baby first time bible. Auntie Shirley said so that I will get to know Jesus as I grow up. Daddy read me one of the stories in the bible that night and I love it! I paid attention to the whole story. Auntie Shirley also got mummy some gifts. Auntie Shirley made her a very lovely cupcake scarf, some baby scrapbook stickers and a very pretty ear rings. Thank you Auntie Shirley, we love love love the pressie so so much. We can't wait to see you soon in Melbourne! Love you!! !